The reason why Tweakware still remains the best VPN app on Android is because it's programmers are very active with releasing new versions and fix as soon as the need arises. Tweakware has now gotten to version 5.7 which from my experiment is working very well, but i sensed the programmers has increased the number of ads that comes up and how fast it comes, this would probably disturb you while in the app interface. 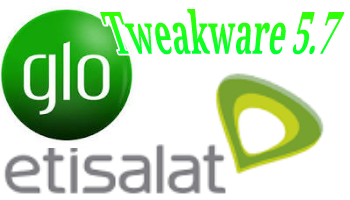 With this new version of tweakware you would be able to continue browsing and downloading for free using your Etisalat Chatpak or your Glo 0.0, both are still working as at the time i checked ( This Morning ). I've not been able to fully confirm if the Etisalat Chatpak is capped or not but am very sure the Glo 0.0 is unlimited and not speed throttled. Etisalat seems to be better if you compare the speed to that of Glo, nevertheless some people still prefer Glo as they wouldn't have to sub for any before using it and also it is unlimited. The speed of every network depends on the level of coverage it has at that particular location, so if you have a very good Glo network coverage then you would be able to enjoy the free browsing at a good speed. As I earlier said, you have those two networks to choose from and then start downloading. All you need to do is Download Tweakware 5.7, Open it and select your preferred Tweak and Server, Then you tap on the Connect button. That's all and once it connects then you can start browsing and downloading. Actually the last time i checked which was about a week ago, then it wasn't throttled but i would check again to be sure if it still isn't throttled till now.